City of London agrees support for Crossrail Art Programme - Crossrail . For information about the Elizabeth line please visit the Transport for London website. The City of London Corporation has given a major boost to Crossrail’s ambitions to deliver a world-class artistic legacy to London, through a funding agreement announced today. The City Corporation will match fund 50 per cent of The Culture Line, a permanent exhibition of large-scale art works across seven London Crossrail stations, designed in collaboration with London’s leading art galleries. The artworks will be permanently integrated into new stations at Paddington, Bond Street, Tottenham Court Road, Farringdon, Liverpool Street, Whitechapel and Canary Wharf. It is hoped they will deliver inspiration and pleasure to London commuters for generations to come and become a destination for art-lovers world-wide. Crossrail’s Advisory Art Board is now marketing to businesses and philanthropists in the UK and internationally to secure funding for the additional 50 per cent of the artworks. Businesses will have a once in a generation opportunity to associate their brand with an iconic piece of London infrastructure and some of the world’s most famed galleries and artists. The Culture Line is one of the largest, collaborative public art commissioning processes in a generation. Crossrail is Europe’s largest infrastructure project, and The Culture Line is an integral part of its efforts to design and build new high-quality stations and to vastly enhance areas above and around the new stations. In March 2013 Crossrail unveiled the first artwork to be selected for The Culture Line, with international artist Spencer Finch’s A Cloud Index to be built into the 2,300 square metre glazed station canopy at Crossrail’s new Paddington station. The result will create a picture of the sky in the tradition of English landscape artists Constable and Turner, and an arrangement of more than 25 different types of clouds. Artworks are being selected by an advisory Round Table of representatives from national and local arts organisations and commercial galleries. 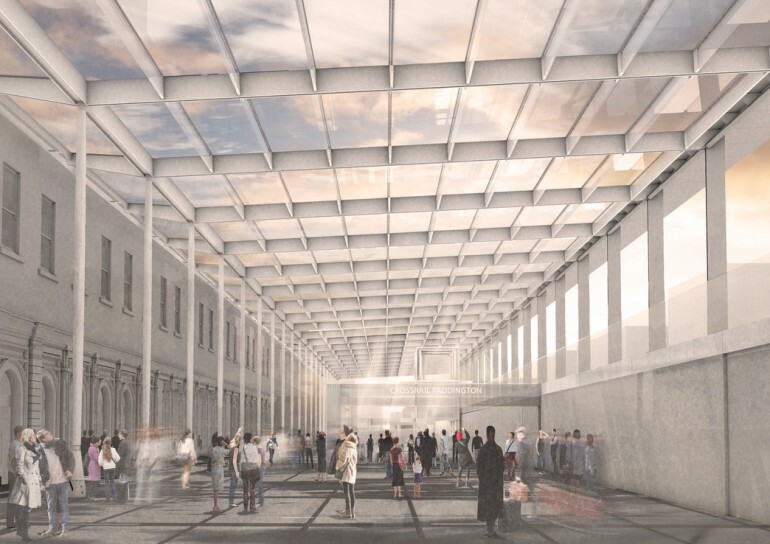 Among the galleries already identified to work in partnership with Crossrail are Lisson Gallery for Paddington station, Victoria Miro for Liverpool Street, Gagosian for Tottenham Court Road, White Cube for Bond Street station and Sadie Coles for Farringdon. Crossrail is in discussions with other renowned galleries for the remaining stations at Whitechapel and Canary Wharf. The Culture Line will engage seven world renowned London art galleries, together creating a permanent line-wide exhibition across seven Crossrail stations. The result will be a series of seven unique destinations, with an art commission of international importance embedded into the design and architecture of each station. The Crossrail Advisory Art Board have volunteered their time, and include: Michael Cassidy CBE, Non-Executive Director for Crossrail and former Chairman of the Museum of London; Colin Tweedy LVO OBE, Managing Director of The Building Centre and Former Chief Executive of Art & Business; Susie Allen MA RCA, Founding Director of Artwise; Lydia Yee, Curator at the Barbican Art Galleries; Whitney Hintz, Curator of the Hiscox Collection and Independent Arts Adviser; Ann Elliott, an independent curator and Fellow of the Royal Society of Arts; David McNeill, Director of Public Affairs and Stakeholder Engagement at Transport for London; Will Parkes, External Affairs Director at Crossrail; Christina Andersen, Art Programme Officer at Crossrail; Richard Brown, Lead Architect at Crossrail; Sam Richards, Head of Urban Integration at Crossrail; and Futurecity. This panel works together with the Galleries’ representatives and station architects to select inspiring art. When Crossrail opens it will increase London's rail-based transport network capacity by 10 per cent, supporting regeneration and cutting journey times across the city. Crossrail services are due to commence through central London in 2018. The City of London Corporation provides local government and policing services for the financial and commercial heart of Britain, the 'Square Mile'. This encompasses three roles: (1) we support London’s communities by working in partnership with neighbouring boroughs on economic regeneration, education and skills projects. In addition, the City of London Corporation’s charity City Bridge Trust makes charitable grants of more than £15 million annually. (2) We also help look after key London heritage and green spaces including the Museum of London, Barbican Arts Centre, Tower Bridge, City gardens, Hampstead Heath, Epping Forest, Burnham Beeches, and important ‘commons’ in south London. (3) And we also support and promote the ‘City’ as a world-leading financial and business hub, with outward and inward business delegations, high-profile civic events, and research-driven policies.